Important: Before buying Mortal Kombat 11 for Xbox One, Gocdkeys would like to remind you that this product can be available in different versions and formats. Although most XBOX ONE games are globally activated, especially digital versions, some may have regional blocking, so we recommend reading all the information about it. The digital versions of Xobx One games are usually cheaper than the physical versions, and usually are in key format, so we simply enter the code we receive after purchase in our Microsoft account to start downloading. 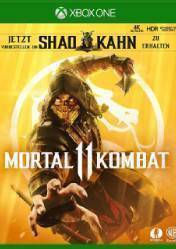 Most of the versions shown in the price list of Mortal Kombat 11 for Xbox One are in key format or cd key. The versions of Amazon and the rest of stores, which have a higher price, are physical versions. The Premium version of Mortal Kombat 11 for Xbox One has been added to the list of stores, which includes much more content than the standard version. The Premium version is only available in digital format at the moment. Shops such as Amazon, among others, may launch a physical version of the game.